MISSOULA – Most aircraft slicing through the smoke above wildfires either drop water or smokejumpers in an effort to manage fire on the ground. But one plane – a flying laboratory carrying researchers from the University of Montana – has the capacity to change what we know about future fires. This summer, the four-engine cargo plane spent more than 100 hours slicing through smoke above fires burning in the West, collecting data about the chemical composition of smoke and how it changes over time and travel. The National Science Foundation National Center for Atmospheric Research C-130 research aircraft (http://bit.ly/2OC2vqr) was based in Boise, Idaho this summer, but it sampled wildfire plumes in California, Oregon, Washington, Idaho, Nevada and Montana. The results will provide a new understanding of air quality and how it may affect populations downwind. Assistant Professor Lu Hu from UM's Department of Chemistry and Biochemistry, along with four UM graduate students, are part of the research team funded to work on the study through a multimillion-dollar collaborative NSF project called the Western Wildfire Experiment for Cloud Chemistry, Aerosol Absorption and Nitrogen, or WE-CAN. It is the "largest, most comprehensive attempt to date to measure and analyze wildfire smoke," according to the NSF. More information on the project is online at http://bit.ly/2OCskXq. Hu and his atmospheric chemistry group are leading the investigation into chemistry and emission of organic pollutants from smoke. The team deployed UM's new mass spectrometer on the C-130 research aircraft. This instrument provided real-time measurements of volatile organic compounds in wildfire smoke and more insight into organic gas composition than previously possible. The emissions from wildfires are typically toxic, and they can form ground-level ozone and fine particulate matter, which are linked to serious health impacts and regulated by the U.S. Environmental Protection Agency. "We expect to observe many toxic species from smoke that had been rarely characterized or reported before," Hu said. "This unprecedented and rich dataset will help us better predict air quality downwind and understand how fire smoke impacts the climate system." Back in the lab on campus, Hu and his team focus to interpret how cloud chemistry, aerosol absorption and reactive nitrogen in wildfire plumes affect air quality, nutrient cycles, weather, climate and the health of those exposed to smoke. The collaborative study includes researchers from Colorado State University, the University of Colorado-Boulder, the University of Wyoming, the University of Washington and the National Center for Atmospheric Research. As part of this project, Hu teaches students aircraft observations in UM's new Atmospheric Chemistry course. This educational initiative is co-led by Professor Emily Fischer of Colorado State University and Professor Shane Murphy of University of Wyoming. There are more than 30 students across three universities in the course, including seven students from UM. The class brings the C-130 flying laboratory into a classroom. Students learn about the aircraft-based mission design and flight planning, and they just planned and executed three flights with the C-130 aircraft in early September. 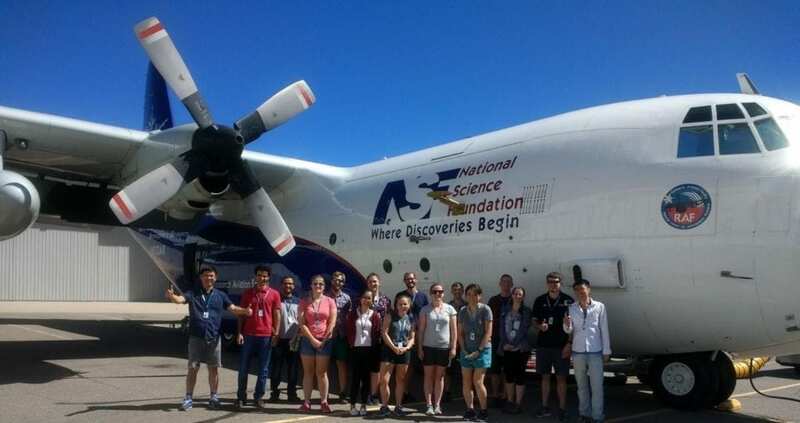 Last week, UM students traveled to Broomfield, Colorado, and visited other state-of-the-science laboratories of NCAR along with their educational flight. Students will present what they learned from their educational flight later in the semester. "Bringing cutting-edge research into a classroom is very fun and a great experience for both students and instructors," Hu said. "Opportunities for aircraft observations being taught and experienced in a classroom are almost zero due to reasons like the limited accessibility and perceived high expense. I am just extremely happy that our UM students are involved in this rare and valuable educational opportunity." The course is sponsored by the UM College of Humanities & Sciences Toelle-Bekken Family Memorial Fund Award and the Department of Chemistry and Biochemistry. For more information on the project, call Hu at 406-243-4231, email [email protected] or visit http://hs.umt.edu/luhu.